Family of soldier Ronen Lubarsky, killed during recent operation, demands military advocate seek death penalty for Ronen's murderer. 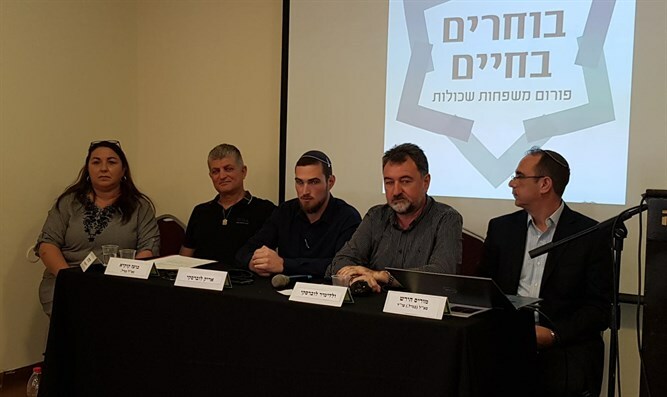 The family of Ronen Lubarsky, a soldier from the elite Duvdevan unit who was murdered by a terrorist during an operation a month-and-a-half ago, held a press conference Tuesday together with the "Bochrim Bechayim” (“Choosing Life") forum of bereaved families and demanded that the Military Advocate General apply the death penalty for the terrorist who murdered Ronen. "The family receives millions in support from the Palestinian Authority, and there is no reason for this terrorist to enjoy 5-star prison conditions and to serve as a bargaining chip in transactions. He needs to be sentenced to death. Only that will ensure that he does not return to murder and encouraging murder," Vladimir added. Arik Lubarsky, Ronen's brother, added: "I was asked what I think about the idea that the IDF has to win rather than be moral. I do not understand why there is a contradiction. It is immoral that murderers enjoy salaries, the conditions of a hotel in prison, praise and honor in the PA, which aspires to be a state next to us. After that, they get out of prison and return to murder. This is immoral. The IDF and the State of Israel must finish it - this is moral." Col. (res.) Morris Hirsch, former legal adviser for Judea and Samaria, presented data on the funds transferred to terrorists. "Ronen's murder is the result of the wild incitement and glorification of the family of the murderer by senior PA officials, in addition to the millions of shekels paid by the PA to the family only because the family murdered Jews." "The recent case of the late Ronen Lubarsky is a clear case in which the death penalty is required. This will save many lives in the future. An Israeli terrorist who murders an Israeli soldier or civilian - this is a betrayal of his country," they stressed.